You're a transformation professional. You're a coach, a healer, a therapist, a creative entrepreneur with something to say. Maybe you'd say you're a writer too. You put off journaling even though you know it’s your best medicine. The writing projects, from blogs to books, get lost in "the busy" before they even reach the draft stage. It’s become easy to believe that it’s all been said before by people who are already famous or more successful in your field. Imagine you made your story and your creativity a priority. Imagine you grew to trust your own voice and got used to sharing your ideas with confidence. Imagine how expressing what really matters to you would transform your healing practice and help you reach the people you’re here to serve. could make all that possible? & discover how to tell your Sovereign Story. Where you give yourself the time, space, and permission to prioritize your desire to write your own stories and to write the stuff that builds a business. A compassionate community dedicated to growth where showing up just as you are is what really matters. A place to be honest with yourself about all the ways you resist your own impact, brilliance, and potential. A haven where you can explore what’s hardest to talk about including your struggle for clarity, your confusion about the state of the world, your creative resistance, and your lingering doubts about your skill and your worthiness. A resource for the practical writing stuff: the majority of our members have their own healing, therapy, or coaching practices. We talk about website copy and Instagram strategy as well as soul care in this group! In case we haven't met yet, I'm Marisa Goudy. I'm a story healer, writing coach, and a word witch. I’m also student of energy medicine and Celtic myth. I've earned my stripes as a copywriter, website development firm owner, and digital marketer too. It’s my mission to empower transformation professionals - healers, therapists, and coaches like you - to uncover and share the ideas, feelings, and experiences that matter. Writing has been part of my identity from the very beginning, but I also know what it's like to put down the pen for years and to forget that my mind, my heart, and my soul all need words. Now that I've found my writing groove in the midst of being an entrepreneur, a mama, and an embodied spiritual being trying to schedule in a bit of self-care, I'm here to share all that I know about how to do it sustainably and joyfully. Through writing practice, deep conversation, and energy healing, I help you draft and shape your Sovereign Story. You’ll be ready to stand strong in the story that you must tell, in the story that will promote your work and spread your magic to those who need it. All of us who believe that words have power, that stories transform lives, and that writing helps us know who we are and what we think. All of us who want to make those blog posts, newsletters, articles, and books-in-progress a priority but who keep pushing those writing dates down the to do list. All of us who know that there's more to writing than marketing: there's a deeply personal "Sovereign Story" that you need to explore so you can truly fulfill your mission in life. All of us who are tired of wandering, wondering, and writing alone. What’s included in your Sovereignty Circle membership? Four weekly writing practice sessions held at noon ET on Wednesdays. Every hour-long session includes two brand new writing prompts crafted just for the Sovereign Writers Circle. Opening with a brief meditation and closing with a conversation about what came up for you, there's time to share the ideas that came through and set intentions for future work. You can count on at least 45 minutes to write into the day’s topics or spend time on your own project. One group writing coaching & story healing call. Bring your questions and your works-in-progress to this 90 minute group session. You'll get my intuitive counsel and practical expertise during this meeting You can also expect something of immeasurable valuable: the compassion and wisdom of your fellow writer-healer-seekers who are also on their own quest to discover and tell their sovereign stories. One extra session per month. Either I’ll be teaching a certain facet of sovereignty and writing craft or we’ll welcome in a featured guest expert who joins us to talk about creativity, marketing, publishing, healing, and self-care, and take your questions. A private members’ forum where you can connect with your fellow Sovereign Writers, find inspiration, talk about what's working and what's not, and find readers for your work. Access to the entire library of past calls and prompts: You can press “play” anytime and write along with us. There’s always something special about writing in community - even when you’re connecting across time and space. Discounted one-on-one Story Healing & Writing Coaching sessions: 60-minute sessions with me are usually $179, but you can book hourlong appointments with me for $129 (that's a savings of over 25%). Special access and pricing to my workshops. Most recently, we did a workshop series called Website Copy Rebirthing and many of our members are ready to (re)launch websites that truly reflect who they are and how they serve. The Sovereign Writers Circle is open to new members. This group is an ongoing commitment for committed writers and you're not encouraged to drop in and out. Re-entry into the group after cancelling your membership is at the administrator's discretion. Apply now and, if we're a match, you'll be invited to join us on the first of the month. Want to set up a 15 minute chat to see if the SWC is right for you? Book an appointment or email me. And yes, that button says “apply.” I’m not here to judge your writing. (That’s NEVER my job!) I’m interested in you, your goals, and whether you’re a fit for the energy and goals of the group. You have a story - or countless stories - that you long to tell. You know you feel better when you write. You often find it difficult to describe the stuff that matters most. You’re interested in the practical and the magical when it comes to self care, business growth, and being seen. You embrace a progressive view on society, culture, and spirituality. You’d thrive in a circle of meaning makers who believe in magic and are also on a mission to make the real world more beautiful, bearable, and bold. You don’t enjoy writing and can’t see it as a kind of self care you want to make more space to do. You’re looking to churn out blog posts that fit some kind of marketing formula. You want fellow writers to critique your writing. This group is about discussing and sharing ideas and inspiration. If you want intensive support around the craft of writing, let’s talk about about individual writing coaching. Loraine Van Tuyl PhD, is a licensed holistic psychologist, shamanic practitioner, and author of the memoir Amazon Wisdom Keeper: A Psychologist's Memoir of Spiritual Awakening. She calls herself "your go-to expert for soul archeology and alchemy." Loraine talks with us about what it means to be a therapist who is telling her life story, her publishing journey, and the magic she lives every day. Sheena Blake is the CEO of Discovering Diversity Publishing. She is also a writer and speaker and passionate about words. We dive into what it means to build your own platform for your story and Sheena's mission to publish people of all ages from all walks of life in every genre. Robyn Ivy, is a photographer, visual brand strategist, creative director, speaker, and coach. She talks with us about what it means to see and be seen as individuals and as creatives. We also explore how photography and the act of looking at the world through a new lens can transform your writing. Elizabeth Cunningham is the author of the award winning Maeve Chronicles as well as several other novels and collections of poetry. An ordained minister with her own counseling practice, Elizabeth brings her creative and spiritual insights to our ongoing conversation about creative sovereignty. Leisa Peterson is a money and abundance coach, educator and creator of the Art of Abundance podcast. Leisa brings her intuitive magic to speak right to the professional growth, personal worth, and money issues that participants bring to the circle. Nikki Groom, creator of the Movement Makers Podcast & Mastermind, is a business and brand strategist for purpose-driven entrepreneurs and mission-driven organizations. Nikki talks with us about what it means to scale your business and truly begin to build a movement with your world-shifting ideas. We have six sessions on the Zoom video conferencing platform each month. When you join the Sovereign Writers Circle, you’re asked to set aside time at noon ET every Wednesday. Writing Practice Sessions are held every Wednesdays at noon ET. You’re also invited to join us one or two Mondays at noon ET per month. What if I miss the calls? All sessions are recorded and made available the same day. Ideally, you'd make at least half of the six monthly sessions, but you can also get a lot out of the group by tuning into the recordings and checking in on the private Facebook group. Do I have to be a “real writer” to join the SWC? First, I despise that phrase. I think "real writer" is used as a weapon by people who have supposedly “made it” and hold up their publication credentials as a badge of honor to cover over some shadowy stuff underneath. Do you wish that writing was part of your life on a daily or weekly basis? Are you willing to shift your schedule, watch less TV, and commit to your writing dates with the group and with yourself? Congratulations, you’re a writer and you belong here with us. This is what you know: You may not feel completely comfortable calling yourself a writer (yet), but picking up a pen tends to help you feel better and you feel called to use words to make your mark in the world. What sort of projects are Sovereign Writers working on? At the core, it’s all “personal writing.” Many are professionals who are working on writing content to build their coaching, healing, therapy, or other creative small business. Others are focused on longer term book projects (or would like to be). Several of our writers aren't working on anything specific are with us for the joy and the journey offered by each prompt... They don't know where their words going to take them (yet), but they trust that it's going to be good and they know it’s necessary. You have the option to chose a quarterly or half-year membership. This group is ongoing and is intended to become a fundamental, longterm resource that furthers your creative and professional development. You're not encouraged to drop in and out. Re-entry into the group after cancelling your membership is at Marisa's discretion. More questions? 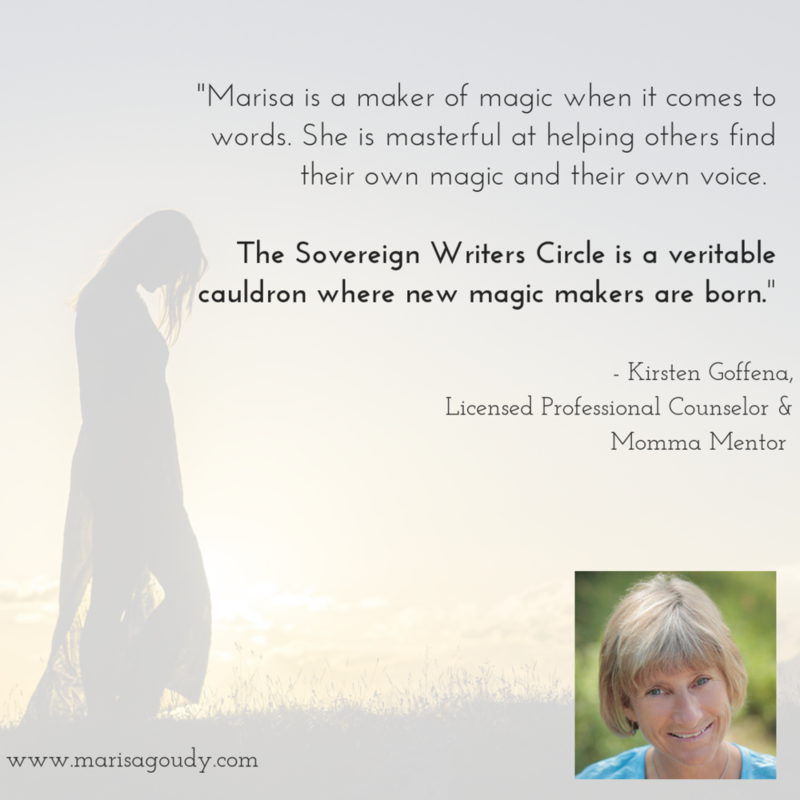 Email me or set up a free 15-minute consultation to see if the Sovereign Writers Circle is right for you. Let’s radically reframe the relationship between your words, your work, and the yearning to express your truth. It’s time to encounter the healing power of your words. develop your personal, creative, and professional practice. I completely believe that it's possible for you to make room for both the writing and the healing work - and all the other magical aspects of who you are. It's my great privilege to help you balance the creative practice that feeds your soul and builds your professional practice.